Spark44 had outgrown its existing office in both size and function. The space was fragmented and did not speak of the creative and collaborative culture that advertising agency Spark44 is known for. So Align was brought in to create a bespoke workspace environment that can be a fitting home for Spark44. Located on Old Street Roundabout, in two floors of AHMM’s new office and retail development the White Collar Factory, Spark44 now has an office that directly reflects its identity as a global creative agency, is bespoke and user-centric in both function and aesthetic. 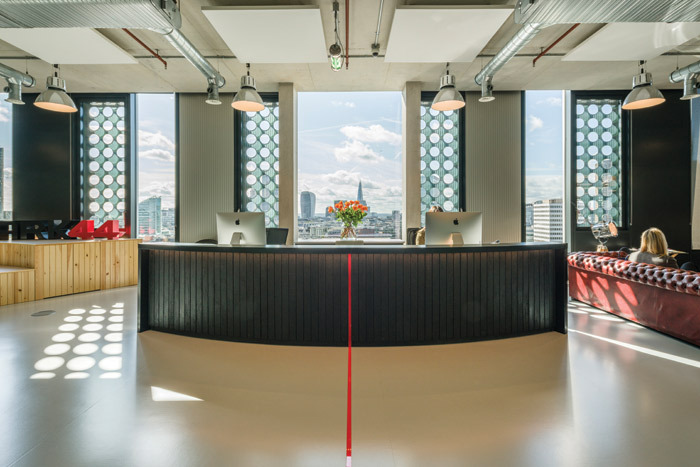 Occupying the 11th and 12th floors, the new space is designed around the London office’s unique role within the wider company to solely fulfil creative projects for Jaguar Land Rover. 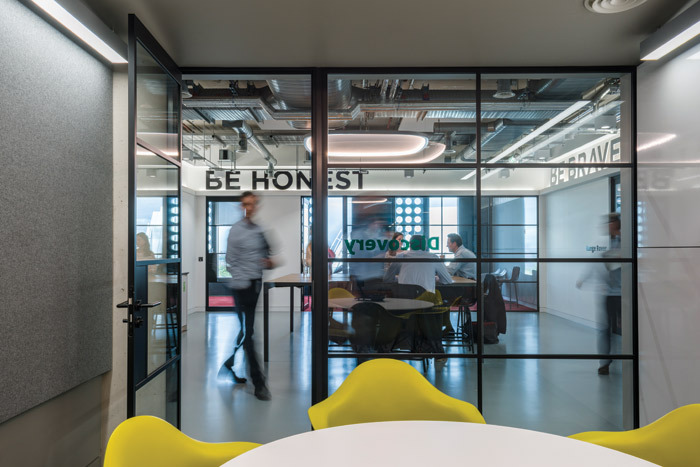 This required careful spatial planning to achieve a balance between facilitating the very close working relationship with Jaguar Land Rover and providing privacy for the Spark44 creative team. ‘There had to be a sense of shared ownership and belonging in the scheme that reflected that partnership, but without compromising the agency’s campaigns and confidentiality,’ explains Align director and co-founder Gurvinder Khurana. Staff and guests are welcomed out of the lift on the 11th floor by a curved reception desk, sitting in front of London’s iconic skyline. The black metal top of the desk sits on charred cedar cladding. A bold line of Plexiglas in Spark44 red runs down it and across the floor, a visual device that links the spaces and reference’s the brand colour, while a stepped natural timber seating area is set beneath a 3D Spark44 logo. Also on the 11th floor is openplan office space, meeting rooms, booths and a breakout area, all furnished by a mix of new bespoke furniture, designer pieces and repurposed pieces from Spark44’s old offices. Spark44’s bold monochrome colour scheme accented in red and its mantra of Be Bold. Be Brave. Be Honest is used throughout to underline the agency’s core values. The office’s unique relationship with Jaguar Land Rover is referenced by naming each meeting room and boardroom after a car model. 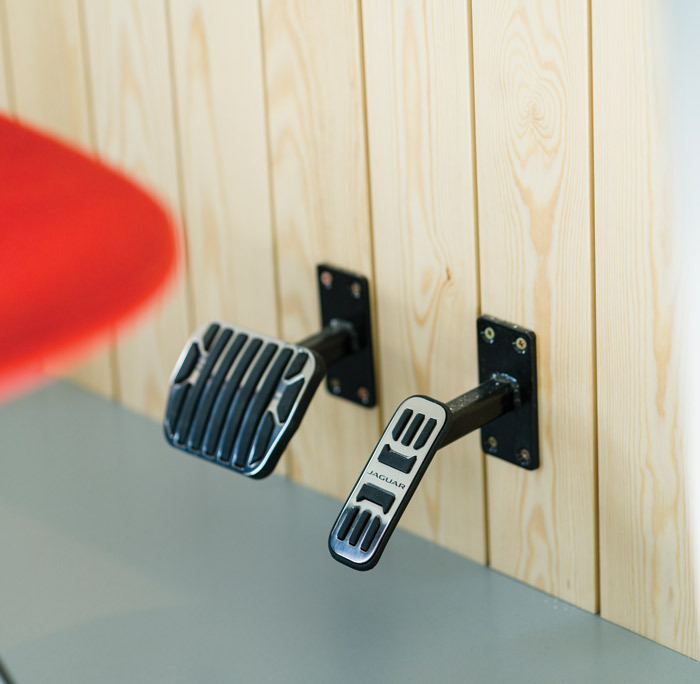 Car inspired details, such as a table with a twin exhaust pipe and foot pedals set in a wall, reinforce the office’s identity. A frameless glass partition subtly separates the client side from the rest of the office. This allows privacy for the Spark44 team while maintaining openness in its ability to blend into the surroundings. it also references the close working relationship between the two companies, while preserving autonomy. Set within the open-plan office is what Align refers to as the ‘town hall’ stage area. Mimicking the unstained timber of the reception seating, its steps have a double function, concealing equipment used to transform the heart of the office into a podium for events and meetings. Level 12 is dedicated to Spark44’s creative team. The design echoes that of level 11 while allowing a more intimate, secluded area for the team to work privately. Underpinned by a modern, flexible approach to workplace design, Align has considered every aspect of the way in which Spark44 works and designed to it in detail. The agency does not subscribe to the traditional 9-to-5 working model, it adapts to deadlines, time zones and differing creative environments. The agency needed its workspace to reflect this culture and Align has delivered this through both technological and spatial design. Agile working is encouraged through an additional 96 work points to the 234 desk spaces. This allows staff to both move and collaborate freely and also supports Spark44’s potential to evolve and grow. Being located on the so-called ‘Silicon Roundabout’, technology has been utilised in every way possible to aid the way Spark44 works. For example, a 90in touch screen in the stage area can be used for presentations, that can be shared across all screens. The stage has fully integrated AV equipment, allowing the entire area to be transformed. The office is zoned for playing music – allowing control over reception and kitchen areas – welcoming guests to a united office and setting its character. Sensors are used to activate screen mirroring in the boardroom when the dividing screen is open – making the flexible and adaptable nature of the workspace seem effortless. The success of this project is in its use. The Spark44 team, along with Jaguar Land Rover, has adapted to the new office space in a way that seems totally natural. Milind Raval, who oversaw the project as UK MD of Spark44, said of the end result: ‘You always know it’s a good space when people walk in and without telling them what the space is designed for immediately start using it, without having to have it explained to them.